Okay, so I was wrong: so, so, wrong. 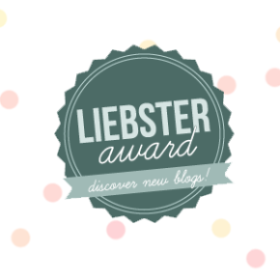 This post is part confessional, and mostly educational. I never claimed to be perfect. I never claimed to be an expert on all things autism — or parenting in general — as I am very open about the fact that I am completely “winging” this whole “parenting” thing. Sometimes, I’m just going to mess up and get it all wrong. I wish every parent of child on the spectrum could read this. Last week Cassius had a pretty intense meltdown that left me so wiped out I wasn’t sure I was even going to be able to pick myself up off the floor. I wrote about it here, and despite the fact that I now know in many ways I was wrong, I’m not going to edit or change that post retrospectively. This is a blog about our journey, and just as in life you cannot hit rewind — and thus, you learn tough life-lessons as a result — I am taking this opportunity to share my knowledge and experiences with you, in hopes that you won’t make the same mistake I did. After the meltdown that defined all meltdowns, [or tantrum, whatever! ], I went home and nursed my wounds for a few days. As I do, I tended to my wounds using my words: using my drafts as a bandage to help ease the arterial bleeding of my emotionally exhausted heart. After a long rest that lasted days, I recovered. You must understand that Cassius gets very easily overstimulated — particularly if anything is on his skin. This includes dust, dirt, and sweat. So to see him working — really, really working — and drenched in a sweat as he was working meant that he was really giving it all. Now, I know my child enough to know that he was mostly motivated by the “screen-time” he wanted to redeem, but I also like to think that, in his own way, this was his way of making things “right” between us. 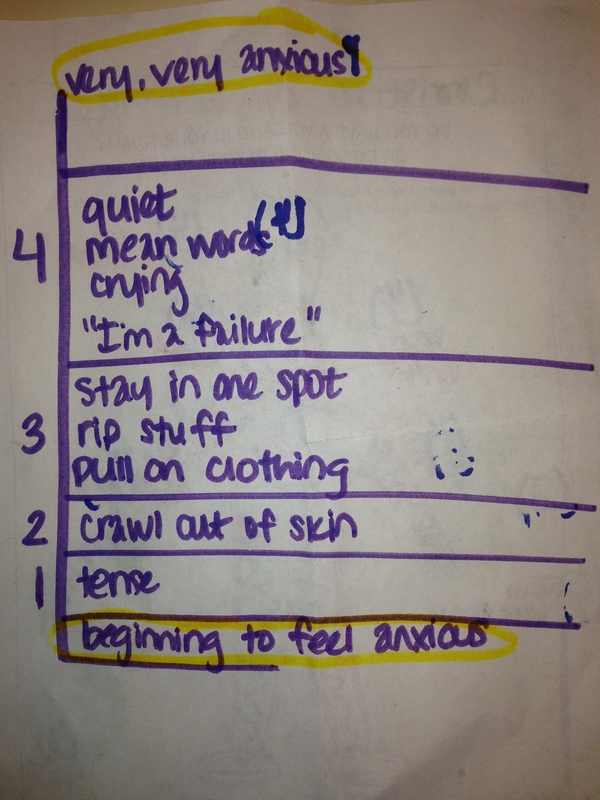 Together they worked through the escalation (rated 1 – 4, 1 being calm, 4 being completely melting down). They drew what his body was doing numbered it accordingly (see next image). If that doesn’t make you want to cry, nothing will. We’ve known for a while that he is dealing with pretty severe anxiety. We have known that his baseline anxiety level is already much to high (due largely to the bullying and other traumas he has had to endure over the past few years). As a result, he escalates very quickly. I thought that I understood the difference between a meltdown and a tantrum. These are the corresponding numbers that go with the drawing. What I neglected to understand was his overwhelming, and unbearable, anxiety. I did not know that anxiety can present in many, many different ways. While researching this post, I discovered that anxiety is often misdiagnosed, especially in a pediatric population that is often limited in their verbal expression. In fact, anxiety can be misdiagnosed as anything from personality disorders, traumatic brain injuries, chronic pain, and “stress” (click here for a full list of commonly misdiagnosed conditions that could, in fact, be due to anxiety: you really should look at this list, its incredibly long and includes both physical disorders such as irritable bowel syndrome, as well as pscyhological/neurological disorders). And Oppositional Defiant Disorder, or ODD. Most children have occasional temper tantrums or outbursts, but when kids repeatedly lash out, are defiant, or can’t control their tempers, it can seriously impair their functioning in school and cause significant family turmoil. Often, these children are thought to have oppositional defiant disorder (ODD), which is characterized by a pattern of negative, hostile, or defiant behavior. Symptoms of ODD include a child losing his temper, arguing with adults, becoming easily annoyed, or actively disobeying requests or rules. In order to be diagnosed with ODD, the child’s disruptive behavior must be occurring for at least six months and be negatively affecting his life at school or at home. Children with anxiety disorders have significant difficulty coping with situations that cause them distress. When a child with an untreated anxiety disorder is put into an anxiety-inducing situation, he may become oppositional in an effort to escape that situation or avoid the source of his acute fear. For example, a child with acute social anxiety may lash out at another child if he finds himself in a difficult situation. A child with OCD may become extremely upset and scream at his parents when they do not provide him with the constant repetitive reassurance that he uses to manage his obsessive fears. “It probably occurs more than we think, either anxiety that looks disruptive or anxiety coexisting with disruptive behaviors,” said Dr. Busman. “And this goes right back to why we have to have a comprehensive and good diagnostic assessment.” (click here for the entire article). 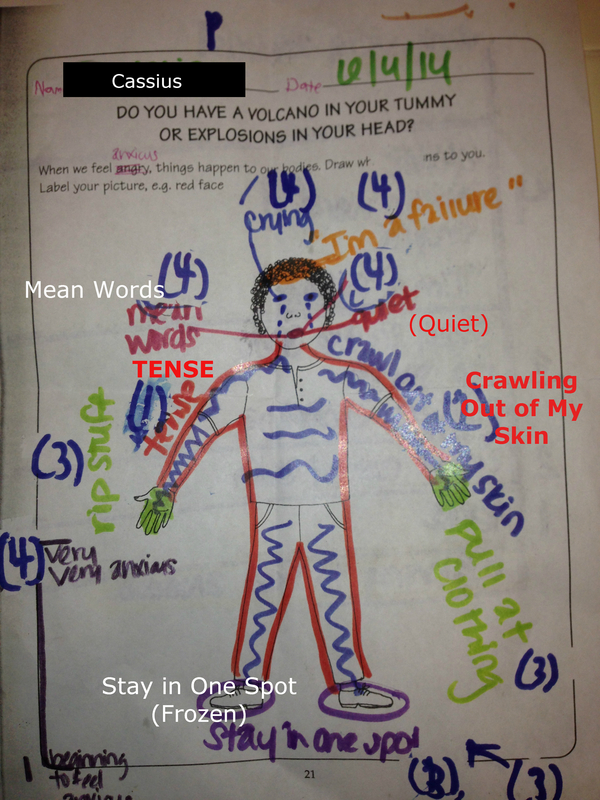 After Cassius chose to share the worksheets he and Melissa (his ABA therapist) had completed, I began to rethink everything I thought I knew about the whole meltdown-vs-tantrum debate (which is pretty much summed up in the image below). This is pretty much my previous understanding of the meltdown-vs-tantrum topic. I now realize, that while this a fair guideline to consider when your child is falling apart, it’s not quite so black-and-white: a tantrum can lead into a meltdown, and a meltdown can lead into a tantrum. There aren’t any clear lines here, and there are countless things that can cause a child on the spectrum to come undone, that simply may not fall as neatly into a power point screen-shot. One of my greatest resources in this blind journey I’m taking into the world of Autism is the adult Autists that I’ve grown to appreciate, admire, and deeply respect. They are, for all extensive purposes, my guides, and one of my greatest is Michael Crosby. Michael is an Autist that I’ve gotten to know through several different online support groups on Facebook (my favorite is Autism Spectrum Disorders Through My Eyes Discussion Group). He and his wife, and four of their children are also in varying positions on the spectrum. This gives him unique insight, having been on both sides of this equation. As such, Michael is an avid and passionate advocate, and has made it his personal mission, as an adult with autism, to help pave the way for future autists — paving the way through this “wild west” of ignorance and nonacceptance to a world where Autists are accepted, appreciated, and valued. When I shared my experiences with him, this was his response. “[Please realize that] his world is different. Most kid’s are, though. But, what I saw was that he was having a lot of anxiety and confusion that you were fighting with him. That was more overwhelming for him than you may have realized. We’re very intense people, and the more you fought it and pushed him the worse it got. He was actually asking for some compassion and validation for his feelings. He ended up getting very angry and frustrated [about it] because he didn’t understand what had happened except that it had all gone wrong. He didn’t know how to express it, partly because he didn’t understand what had happened, and partly because it probably happens a lot at school (and maybe other places.) I didn’t see a tantrum at all: I saw anxiety and frustration. This happens to a lot of kids, but for whatever reason, most other kids learn to handle it better. Part of it may be that he has a lot of it, compared to other kids. We live in a very frustrating and confusing world, and it builds up over time until it starts to get unbearable. I’m guessing there’s a lot more going on there for him, but it’s probably relatively subtle to you and other people because it’s not out of the range of what you’d expect from most kids. It’s kind of like he’s reached his limit, and now it’s leaking out in other ways. But even then, that must have been frustrating for him. If he’s having tantrums like that, he’s reverting to some extent, which shows how extreme he is feeling. In a way, you do need to stop fighting it, because he will always win. His emotional needs are stronger than your need to make him do stuff. So, regardless of the situation, it’s probably better to slow down and try to attend to his feelings and help him process them so that he can deal with them more effectively. The more that he has these episodes (and the need for these episodes), the more it’s going to screw him up, making it harder to fix (down the road). The worse [he] will get. I was stuck in this cycle myself, until I broke it, which is why it hurt [me so badly] to read [this episode]. [I am] feeling it from both sides. Don’t underestimate the power of just identifying and validating his feelings. At first, that’s all you should do, but then you can start talking about how your feelings fit into it as well. Using these times as teaching and learning experiences can be very helpful, and even [form a bond] between you two. So, yeah, I was pretty wrong. I’m still learning, and I will continue to do so. I am incredibly proud of the person my little boy is becoming, and I don’t want him to struggle any more than he already has to. My new goal is to focus on bridging the gap between the two of us, recognizing that these meltdowns and tantrums are his way of communicating with me that something is wrong — that he is anxious, worried, scared, overwhelmed, or sad. My new goal is to focus on forming the bond that Michael referred to: the bond built on taking difficult situations and using them as learning experiences for the both of us. Something tells me that Cassius will be teaching me life lessons for the rest of my life. To be honest, I’m kind of glad this is the case: he makes the world a better place just by being in it. Side-note: Thank you, to Cassius, and Michael, and all the other Autists in this world that are working every day to make this world a better place, and who always — without fail — manage to teach me something new every single day. Crosby, Michael. Commented response to my initial post (2014). Accessed on 6/18/2014, used with his permission. ← Are Labels Really So Bad? Very helpful and thorough post, thank you! As an adult with Asperger’s, it’s great to see such good understanding of meltdowns from a parent 🙂 I find that the people in my life, including my partner, want to understand but often just can’t. Really interesting reading – thank you. I really, truly appreciate the insight of my adult Autist friends. You guys are, seriously, my navigators. 🙂 ANY insight you might have is ALWAYS welcome and so deeply appreciated. I’ve learned a lot but I have so much more to learn. Especially where there is SO MUCH conflicting information out there! My most trusted resource—over all— is tied for my maternal love and “gut feeling (which can be misleading), and the guidance from the adult Autist community. It was a tough pill to swallow! I’m not a big fan if being wrong ;). I have so, so, so, SO MUCH left to learn! I don’t want to make you feel worse by saying this, but I also feel like you’re the type of person that wants to learn from others so I decided to share it. One of the hardest things about having autism and knowing you have autism is seeing that you can’t deal with something and not knowing what to do about it. This usually leads up to a meltdown. Imagine you’re parachuting out of an airplane and then you realize that you don’t know how to open the parachute. You’d probably be pretty frantically trying to get the parachute open before you hit the ground. That’s what a meltdown is like. We’re trying to save ourselves before we hit the ground. It’s that frantic time when you’re thinking, I can’t do this but I have to do something. We see the “ground” in front of us and we’re frantically trying to save ourselves from it. Possibly the hardest part though is knowing that that “ground” is something relatively simple and even trivial. To everyone else, it doesn’t make sense that we’re reacting like we’re going to die from something like this and it may even seem stupid to us, but it’s a reaction we don’t really have control over. The anxiety is tied to whatever event we feel we can’t do. The best thing to do is to figuratively pull ourselves back into the plane and learn how to use the parachute and then jump back out again. Meaning, stepping back from the situation, returning to baseline, and then trying to tackle the obstacle from the beginning again. I also agree with what Micheal said about validation. When these moments aren’t validated, it makes us feel even more like failures. We probably are already questioning our abilities because what we felt was so hard we know is not a big deal really. So when someone else confirms that thought, it just further confirms the thought that we have failed. Anyway, sorry about the length and I hope this is more helpful than it is hurtful. It was NOT hurtful at all, and completely helpful. I so deeply want to learn! Thank you, thank you, thank you! I appreciate the parachute metaphor. I can SEE that in his face! I don’t hate autism, I appreciate it. But I straight up hate anxiety—both for him, and me! Worst feeling EVER!!! I am autistic. I wouldn’t mind being featured, but I’m a pretty simple person so I can’t guarantee any life changing posts or anything. I just put out there the way I see things and hope that it helps someone. I would love anything you wanted to share! And simple is great– some of the best lessons in life are super simple! I love what you’ve written about meltdowns. Have any thoughts about the best way to handle them? I think the first piece is trying to remove the stimulus. In order to deal with something stressful, you need to be in a comfortable place. For example, in the situation with your son, I would have gone to the car with him and talked out his feelings about the situation. Then, if he was able to realize what was stressing him and to figure out how to approach the situation in a way that would be acceptable to him and you, then you could’ve tried again. Sometimes we need to remove a stressful stimulus in order to process why we have a problem with it. It’s easy for things to be stressful to us because things can seem to come from all sides at you and you don’t see an escape. When someone gives you an escape, you can look back and evaluate the circumstance without being blinded by anxiety. 1. What do you do when the stimulus is the direct consequence of a bad decision the child has made? If you remove the consequence, then they don’t get experience with “natural consequences,” and that worries me. 2. What do you know when the stimulus cannot be removed? 3. What should be done after the end of a meltdown/tantrum? 4. 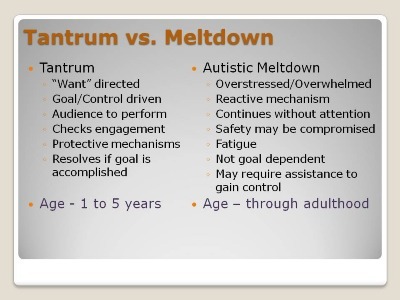 Do you think a tantrum should be treated differently than a meltdown? Sometimes they seem to blend together. 5. Is there any way to prevent them entirely?